Hard-core heli-skiing is not for the fainthearted. You’ll need a lot of skill and deep pockets. The seemingly endless untracked rides can be mind-blowing if conditions are right, but Mother Nature will decide who will be rewarded and who will wait. Here Gerhard Mayrhuber tells us of his experience chasing such powder highs in Russia’s Siberia. 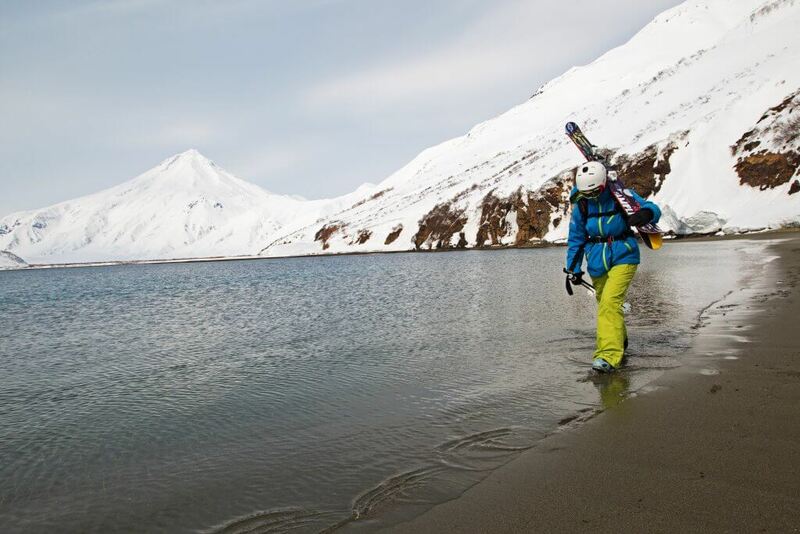 Feel like you are in the wilderness heli-skiing in Kamchatka, Siberia. “Kamchatka? Where the hell is that?” a friend of mine asked when I mentioned that I was planning to go there skiing – or heli-skiing to be precise. Kamchatka is in Russia, about a nine-hour flight east of Moscow, somewhat northeast of Japan and just across the Bering Strait from Alaska. That’s about as far around the world you can travel before you start coming back! It’s a long way to go but the simple fact is that the only place you can heli-ski in Europe is Italy – and it is ever so limited there. For really thrilling stuff, you need to travel further afield to Canada, Alaska, Greenland, Iceland, New Zealand or Russia. Brilliant powder snow and thrilling descents. Another reason was the climate. Before deciding on Kamchatka I also looked at Alaska as a possible destination. However, having met and spoken to a number of people who had skied there over the years I decided against it as the weather pattern in Alaska is a lot less stable. Most weather systems seem to go from west to east and Alaska is right on the coast so it gets a lot of fog, low clouds and wind which is generated over the Pacific and none of that is any good if the only way to get to the top of the mountain is to fly. Siberia’s weather comes predominantly across the mainland and is supposed to be a lot more stable. More on that later! 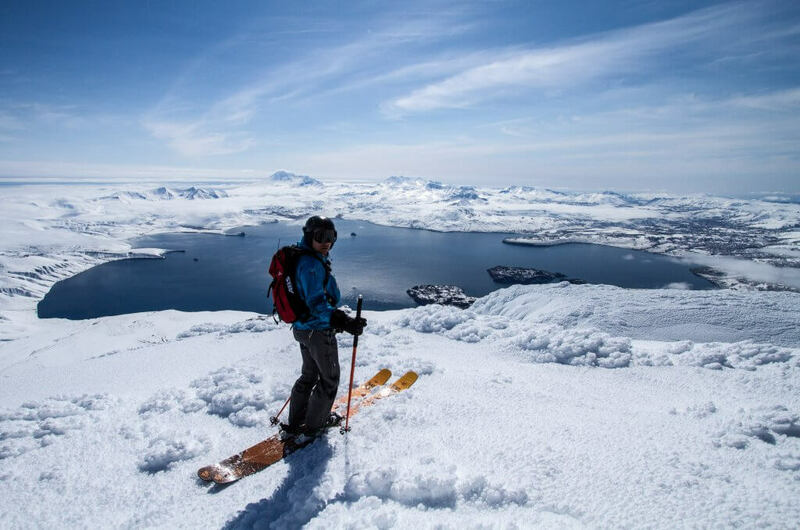 Initially, I was planning to travel alone but when I mentioned my intentions to a friend who can never get enough powder around his ears, it was not long before I had two travelling companions – Dave Dwyer and Tom Moss. Joined by my two friends, Dave and Tom. 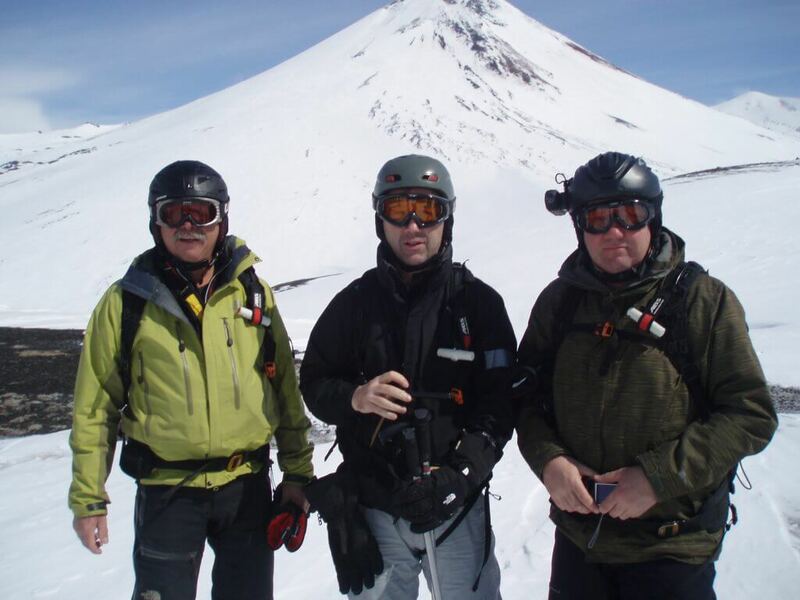 It seems that the prospect of heli-skiing in Kamchatka was too good to pass up! We travelled to Moscow and spent two days sight-seeing which was an absolute eye-opener. Our first impressions were beautiful buildings, nothing but top-of-the-range cars on the busy streets and stunning girls wearing designer clothes wherever we looked. Moscow made Dublin look very provincial, not just in size but also in character. Not only is there a lot of money around, at least on the tourist trail, but you also need a lot to stay there. So be prepared if you are planning a visit! Next, we travelled to Petropavlovsk on Kamchatka, the easternmost peninsula of Siberia. An area approximately as big as Switzerland, the whole peninsula is covered in volcanoes and has been described as a place where the earth is still young and unsure of itself, and where nature constantly destroys and remakes itself. Petropavlovsk is a potentially beautiful city, with stunning and mostly snow-capped mountains as a backdrop, but it is financially starved and shows decades of utter neglect. Buildings that had neither been painted nor maintained since they were built during the Soviet era crumbled but somehow still stood. It certainly appears that whatever taxes are collected in Russia do not reach the far east but seem to stay in the greater Moscow and St Petersburg area. 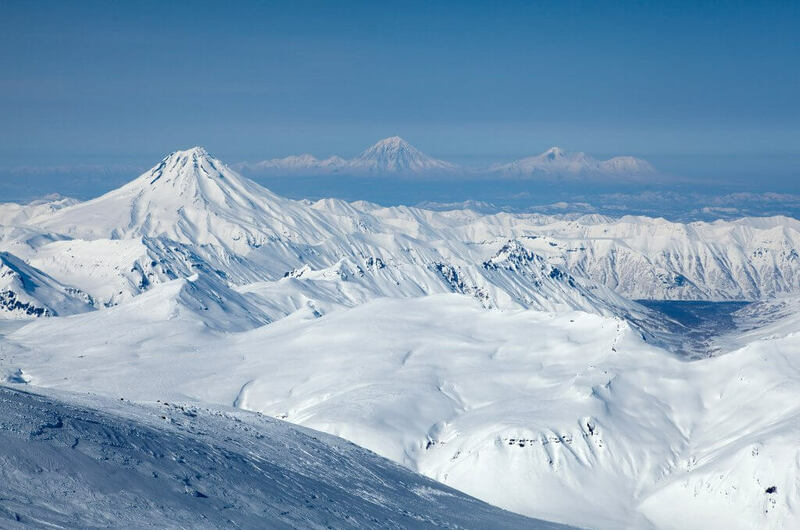 Kamchatka has a population of approximately 190,000, with 90% of the people living in the town. During the Cold War, it was a strategically important naval base. Now a whole fleet of ships can be seen rusting away in its port which today depends largely on fishing for its living. It is a part of Russia with no road network beyond the city environs and none that connect to the rest of Siberia. Conversely, my first impressions of the ski area were, “Wow!” Winter here lasts from October until the end of June and due to consistently low temperatures, it records an annual snowfall of more than 12m. It is a vast and untamed wilderness full of hot springs and volcanoes, some extinct, some dormant and many still active. Volcanoes like Koryaksky, Kozelsky and Avachinsky were all within sight and ranged from 2,500m to 3,400m. Klyuchevskaya Sopka is the highest peak (4,750m) and I am told it is skiable, but was too far north for us to access. 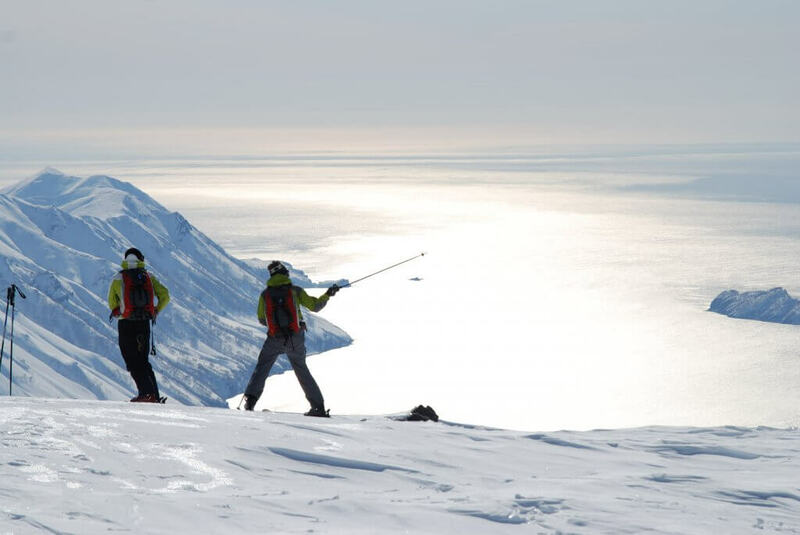 Heli-skiing is not all about skiing from dawn to dusk. It is more about quality than quantity. When you have a helicopter as your sole means of uplift, you are really at the mercy of the elements and it is often not possible to ski from 8.30am until late. So the day starts normally with a guides’ meeting at 9am. Having considered the weather and the avalanche risk they will decide which mountains to ski first. In our case, there were three groups of 12 skiers, each with three guides and one helicopter per group. Males outnumbered females by 11 to one (if only I was female!) and the same ratio applied between skiers and snowboarders. Our group consisted of three Italians, two Scots, two Germans, two Swedes and ourselves. The guides were from Germany, Italy, and Russia. The Germans and Italians led and were responsible for safety while the Russians acted as sweepers and provided local knowledge. This is a land of fire and ice where volcanoes and glaciers say hello to each other. On our first day, we skied 11 runs, varying in length and gradient, clocking up a lot of vertical meters. Snow conditions were not particularly good, ranging from hard-packed to crud to wind-pressed crusty snow and all sorts of other shite. There was very little powder. A good friend of mine always refers to difficult snow conditions as character building; well these certainly were even if we did find better snow as the day progressed. But when you choose to ski off-piste you have to take whatever conditions throw at you. There is no way around that. 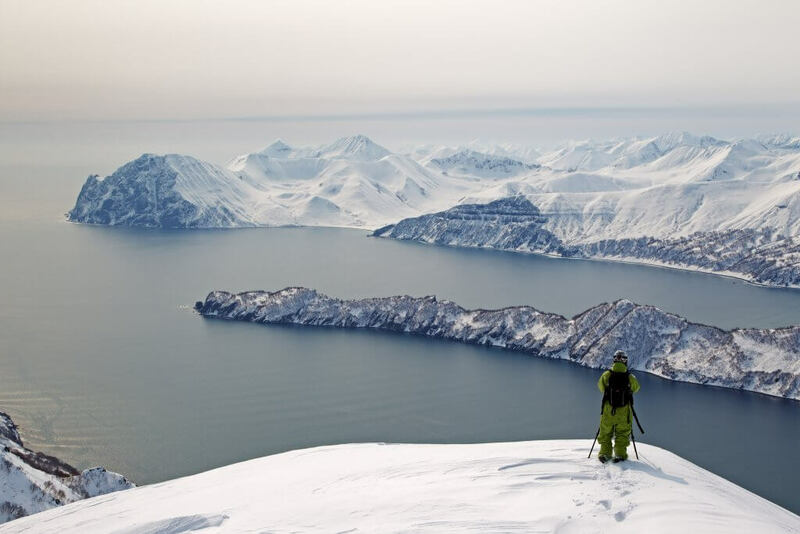 Awesome views heli-skiing in Kamchatka. The scenery, on the other hand, was fantastic. This is a land of fire and ice where volcanoes and glaciers say hello to each other. The views were absolutely awesome. Not all of the mountains, however, are skiable from top to bottom. Sometimes you might only be able to ski the middle or the bottom. The guides are usually in constant contact with the pilots and arrange pick up and drop off points and that can often change during the day depending on wind and visibility. These volcanoes were shaped over thousands if not millions of years through eruptions and as a result tend to have a more predictable gradient than other mountains. However, it’s important not to get too comfortable because when you ski in the wild you never know what is around the corner, behind a group of trees or over the next drop. Sometimes you start in great powder but as you descend conditions change drastically and you can encounter anything from huge boulders to fallen trees, a frozen waterfall or indeed a bear that was woken by the noise of a chopper. This happened on a previous occasion and I’ve never seen guys ski so fast before! It certainly pays to keep your eyes open, not only to admire nature at its best but also to prevent becoming somebody else’s lunch! The pilots were excellent and were able to land a 10-tonne helicopter on a ridge you could not put a picnic table on. On day two, visibility was poor putting it mildly. Low clouds and high winds did not allow the helicopter to operate and as a result, we had a no flying day and the first disappointment. 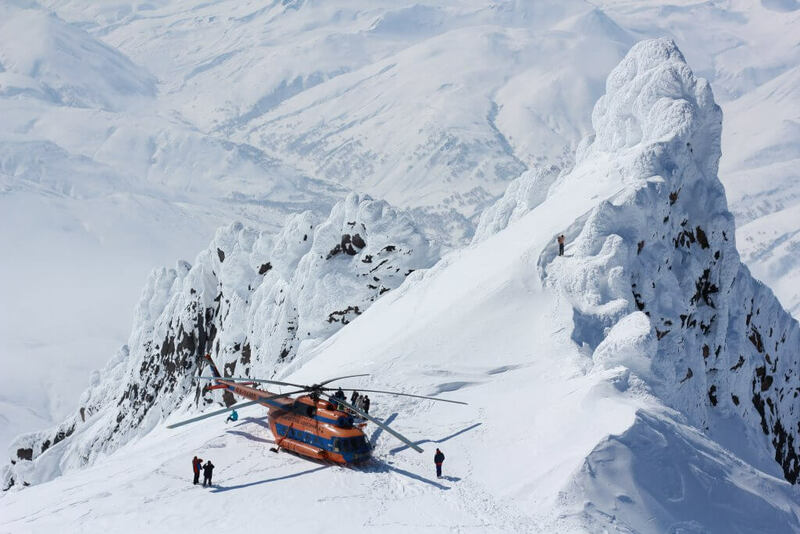 Heli-skiing in Kamchatka is certainly not for the faint-hearted. Day three started with no weather improvement so further guide meetings took place at 10 am and 11 am. Finally, the sky started to clear and we were collected at midday for what turned out to be one of my best skiing days ever. Pure sunshine, deep blue skies, truly stunning scenery, no wind and skiing untracked waist-deep powder in this vast, untainted and unspoiled wilderness. We skied several mountains and got first tracks each and every time. Apart from our group, there were no other humans in sight. Rules and regulations in the modern world mean nothing out here. This is what heli-skiing is all about; this is why we travel so far and why we pay good money, I remember saying to myself! The pilots were excellent and were able to land a 10-tonne helicopter on a ridge you could not put a picnic table on. With the front wheel barely touching the snow for stability and the rear hovering above ground while we jumped out, this requires top-level flying skills, rock steady hands, and even steadier nerves. The pilots have such skill to be able to land on the most difficult ledges. At some stage in the mid-afternoon, the guides suggested lunch but conditions were such that there wasn’t slightest inclination to stop. Never mind bloody lunch! We did not travel this distance to concern ourselves with food; we came here to bloody well ski, we were having a ball and we did not even stop to take photographs. We finally finished the day with a run down the western face of the Avachinsky Volcano at about 6.45pm and enjoyed a few pints to put our achievement’s into context later that evening. Day four started well, but not only was the chosen area not as good, but it had started to snow by 2 pm. Visibility deteriorated by the minute, the winds had picked up and the pilots advised us to finish before it closed in completely. Skiing in bad weather isn’t a problem but flying certainly is! Conditions on day five and six did not improve; all we could do was to skin up the mountain using mountaineering skis. This in its own right is always a great challenge, a bloody good workout and very exciting, but visibility was nil and as a result only a few of us did it. We were lucky that the hotel had a few snowmobiles which we were able to hire and we had good fun racing each other through the vast birch forests. As a seasoned heli-skier, I know that losing one day per week is to be expected but to lose three was seriously disappointing. So much for the weather pattern being more stable! As a seasoned heli-skier, I know that losing one day per week is to be expected but to lose three was seriously disappointing. I’ve since spoken to a Slovenian guy who has skied in Kamchatka for 12 years in a row and told me that he had never lost more than a day there. So what we experienced was the exception to the rule. We were just unfortunate. And that too is what you have to live with when you ski off-piste. And there is always another time! Enjoying the fabulous location on and off the slopes. On all my previous heli-skiing experiences in Canada and the Caucasus region of western Russia, the package was calculated based on the actual vertical meters you ski. Packages vary of course but would normally include a guaranteed 10,000m per week. Fly more and you pay extra. And if you do not reach that target due to weather conditions, you get a small discount. Charges based on helicopter time: While we were there, the charge was based on the actual time the helicopter was airborne, which turned out to be more expensive because you are also paying for the time it takes the chopper to travel from its base to the hotel to pick you up and return you in the evening. That alone was approximately 20 minutes per day. Also sometimes it is not possible for the pilot to land on a chosen peak due to high winds or bad visibility in which case they take you off to a different peak. 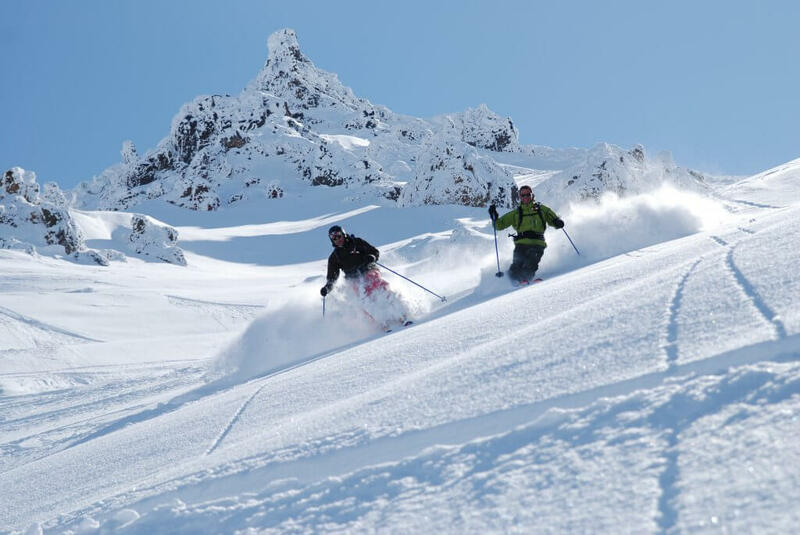 Booking a heli-skiing package: We booked our trip through an agency based in Germany which I would not recommend as the service they provided was poor. You can book directly with the local operator and make sure to tell Vitaly that I sent you! 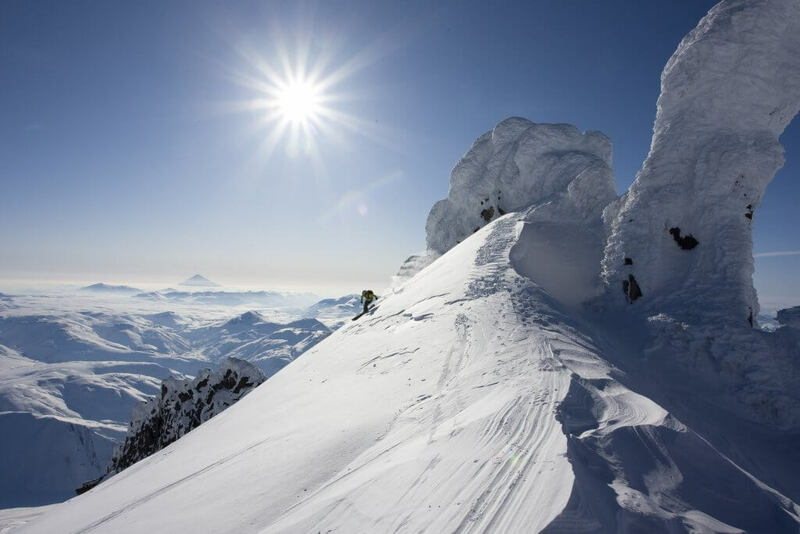 Joking aside our package included eight hours of actual flying time for the week and cost €5,800 which included transfers from Petropavlovsk to the hotel, B+B accommodation in a 3-star hotel and the avalanche pack. Rental skis, if you need them, cost €170 per week. Additional costs: Additional hours are charged at €380 while the refund they give is €350 per hour if you don’t reach that target. Full details are can be found at Heliski Russia. This initially sounded generous but turned out to be everything but! In fact, we clocked up just over seven hours in less than three days. Had we been able to ski for the full week we would have had to put our hands much deeper into our pockets. Be warned! The hotel we stayed in was about 40 minutes’ drive from town and was basic enough but had a super outdoor pool which was fed by hot springs. Gourmets might be disappointed with the quality of food but it was fine for us and we did not travel there expecting top cuisine. You need to budget about €300 for the week for extras. International flights were not included and cost approximately €980. Mesmerising horizons: heli-skiing in Siberia. 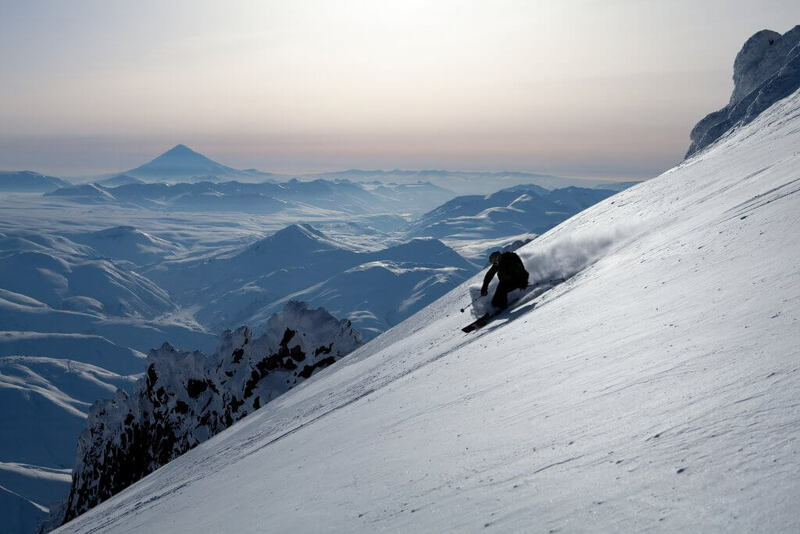 Can anyone heli-ski in Kamchatka? 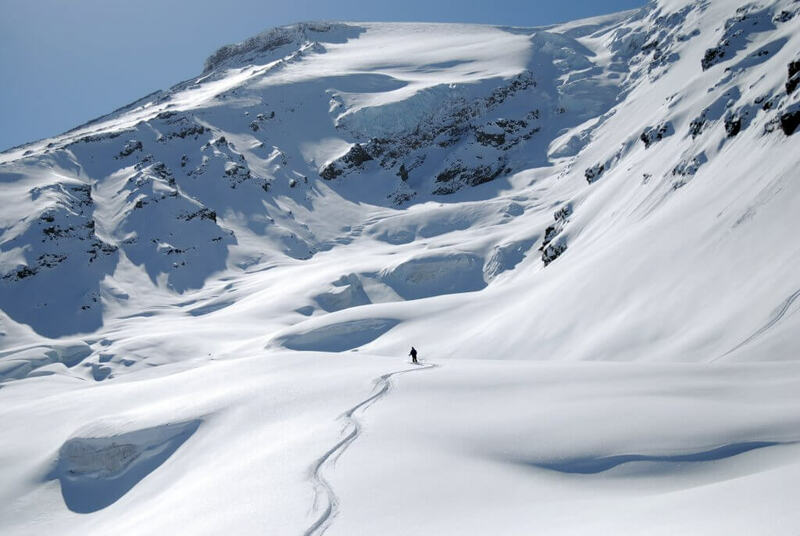 In order to get the most out of a trip like this, you need to be a competent all-mountain skier who can handle all conditions from deep bottomless powder to heavy and wind-pressed icy crud. You will also need a set of fat all-mountain skis, an avalanche pack consisting of a shovel, probe and avalanche transceiver, and a harness if you are crossing a glacier or descending narrow gullies, although we did not actually use the latter on this occasion. The guides are there to help you in all situations and are usually very conscientious when it comes to safety but you need to be equipped to get yourself out of trouble as you are miles from base and usually in the middle of nowhere. Words and photos (unless otherwise specified) by Gerhard Mayrhuber. 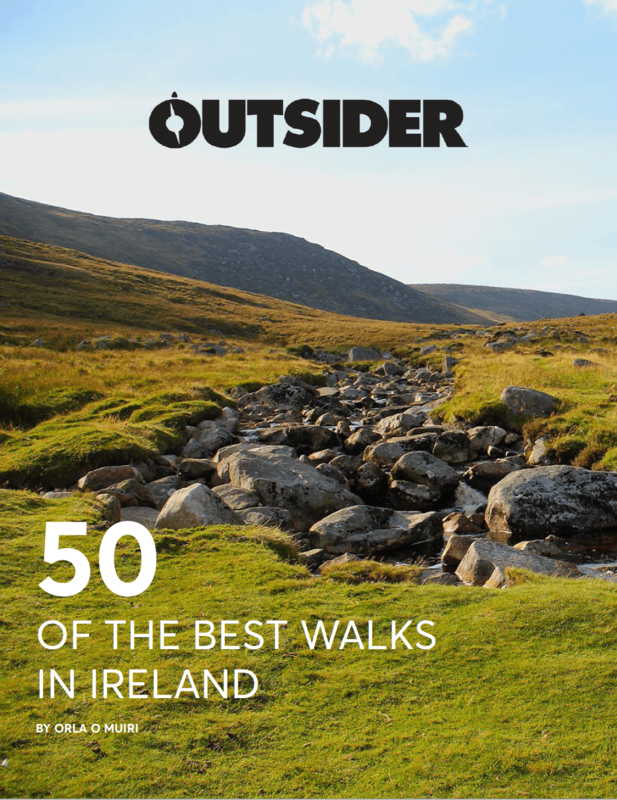 The Outsider Audience Choice Award: VOTE NOW!